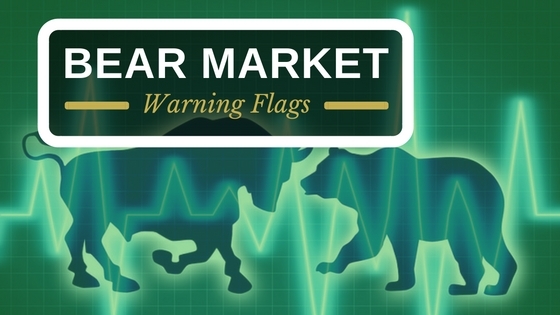 We track dozens of indicators to find early signs of an oncoming bear market. Every bear market in history has provided some level of warning signs, yet not all indicators are present at every market peak. Today, we thought we would highlight a few of the indicators we use as part of our investment methodology. As you know, we utilize an adaptive investment approach which allows us to make changes that will hopefully better align with prevailing market conditions. Optimism at Extreme Levels: Clearly there is not extreme confidence in today’s market. Think back to the excitement surrounding the tech boom of the 90’s and real estate boom of the late 2000’s. We are far from those levels, and it is a good thing for the market. Unfavorable Monetary Policy: In today’s environment we have a favorable monetary policy around the world. Increased Recession Risk: We use a private research group to provide us with their US and Global Recession forecasts. Their models have a healthy success rate of providing early recession warnings. Currently, the six-month risk of recession is only 6.3%. In basic terms, the fear of recession is very low. Reduced Market Participation: This indicator is called “breadth” in the financial industry. In simple terms, this indicator measures the number of stocks that are participating in the markets growth. When many companies are moving higher, it is a good sign. When only a few stocks are keeping the market going up, it is a sign of weakness and signals the long-term trend could start to fall. Right now, out of 500 companies included in the S&P 500, 262 are listed as “strong buys” and only 61 are ranked a “strong sells”. This is favorable market participation and is encouraging for the US stock market. Of these four indicators, all four have been present at the beginning of bear markets going back to 1966. The only exception was 1987 when increased recession risk was not present, but optimism, unfavorable monetary policy, and reduced market participation were all waving warning flags. So this leaves the question, where do we go from here? Obviously, no indicator is perfect at predicting the market, but history (as illustrated above) suggests we are not at a market peak. These indicators have been quite reliable over the past fifty years, and as investors, the odds favor giving this current bull market the benefit of the doubt. As we always say, when the facts of the market change, we too shall change. For now, we keep riding the bull until it cannot take us any further.